Previously, the Cobb County DA was taking into consideration as to whether Birdman and Young Thug should be charged as co-conspirators in the 2015 bus shooting directed at Lil Wayne. Now, audio of a phone call between Birdman and the shooter Jimmy Winfrey while he was in prison has surfaced. In this VladTV flashback from 2016, Deon Cole spoke about Katt Williams and how the comedian told him that he wasn’t funny but that he should continue to keep writing.Watch above. Cardi B’s family is coming to her defense. In the midst of a highly-publicized feud with Nicki Minaj, Cardi B’s sister Hennessy Carolina has taken up the battle on the “Bodak Yellow” rapper’s behalf. 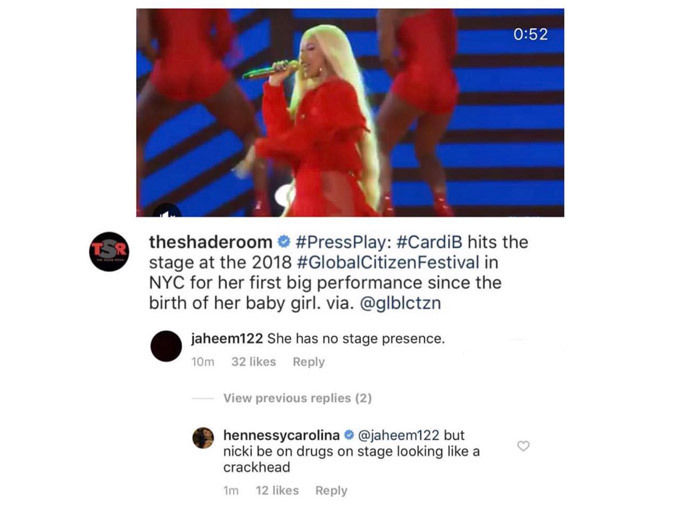 Hennessy saw the comment and responded by insulting Minaj. “But Nicki be on drugs on stage looking like a crackhead,” she wrote. This is the latest episode in the ongoing beef between the rappers. Cardi attempted to attack Minaj by throwing her shoe at a New York Fashion Week party. She also called her out on Instagram for trying to sabotage her career and speaking ill about her daughter, Kulture. Lil Wayne is returning to the charts in a big way. The rap titan’s long-awaited album Tha Carter V is expected to debut at No. 1 on next week’s Billboard 200. According to HITS Daily Double, the album is on track to move 475-525,000 equivalent album units in its first week, of which 165-180,000 are traditional sales. The combined 23 tracks on C5 earned 49.5 million streams in the first 24 hours on U.S. Spotify, marking the second largest debut in the history of the streaming platform behind Drake’s Scorpion (80.5 million). Tha Carter V has since surpassed 100 million streams on Spotify, according to Chart Data. Wayne also occupies 23 out of 25 of the top songs on Apple Music in the U.S.
Lil Wayne's 'Tha Carter V' has now surpassed 100 million streams on Spotify. While the numbers are impressive given Wayne’s seven-year gap in the Carter series, they are still a far cry from 2011’s Tha Carter IV, which sold 964,000 copies in its first week (prior to the streaming era). After much anticipation, Tha Carter V arrived Friday featuring appearances from Kendrick Lamar, Nicki Minaj, Travis Scott, Snoop Dogg, and the late XXXTentacion. Elsewhere on next week’s charts, look out for Logic, whose album YSIV is projected to do 90-110,000 copies (45-55k traditional) in its first week. Meanwhile, Kanye West is expected to release his album Yandhi sometime this weekend. Kanye West kicked off the season premiere of “SNL” as musical guest, but it was his off-air comments that had everyone talking. After his closing performance of “Ghost Town” with Kid Cudi, 070 Shake, and Ty Dolla $ign, West delivered a speech in support of President Donald Trump, which was cut from the live broadcast due to time. The comments were captured on social media by audience members including Chris Rock. He also addressed his controversial MAGA hat. “You see they laughing at me. You heard ’em, they scream at me, they bully me. They bullied me backstage they said, ‘Don’t go out there with that hat on.’ They bullied me backstage. They bullied me. And then they say I’m in a sunken place. You want to see the sunken place? Okay, I’ma listen to y’all now. Chris Rock, who recorded the speech for his Instagram Story, seemed to whisper “My God” at one point. Despite the comments, Kanye has apparently been invited back to “SNL” by the show’s creator Lorne Michaels, but this time as host. had so much fun at SNL. Lorne agreed that I would host before the year is out. Need to set a date. Gonna be sooooooooo lit. In the words of Lil Pump …Esskeetit ! Afterwards, Kanye returned with Teyana Taylor for a performance of “We Got Love,” a song that did not make her K.T.S.E. and an encore performance with Kid CuDi , Ty Dolla $ign, and 070 Shake for the Ye colloboration, “Ghost Town.” During the closing credits, Ye gave a speech on First Amendment and Donald Trump. Prior to releasing his new album Yandhi, Kanye West—or YE as he prefers to be called—returned to television to help kick off Season 44 of “SNL” with some special guests. For the first performance of the night, YE teamed up with Lil Pump for a comedic performance of their hit “I Love It.” Inspired by the song’s lyrics, Kanye dressed as a Perrier bottle, while Pump was a Fiji water bottle. They danced on stage in costume as comedian Adele Givens was shown on the screen behind them. For the second performance, Kanye brought out Teyana Taylor to perform “We Got Love,” one of the songs that didn’t make her album K.T.S.E. due to clearance issues. Teyana showed off her six-pack abs in a revealing sheer top, while YE stood alongside her. He forgot some of the lyrics, but laughed it off. For the encore, Yeezy returned to close out the show with a performance of his ye track “Ghost Town” with Kid Cudi, 070 Shake, and Ty Dolla $ign. Wearing his redesigned MAGA hat, YE started off the song before Cudi and 070 Shake joined in, while Ty played bass. The show went overtime, so the end of the performance was cut during the live broadcast. Yandhi is expected to drop tonight featuring appearances from XXXTentacion and 6ix9ine. In this VladTV flashback from 2012, Game speaks on his battle with Kanye West after a party Nelly had at Niketown before “The Documentary” dropped. He revealed Kanye pulled out all the stops in the battle.